It is said that in Dublin you can experience all four seasons in one day. After a whole week in this quiet yet vibrant city, I can safely say, they are not kidding! Dublin, is located on the Eastern coast of Ireland which makes it quite windy and often wet (it rains an average of 190 days a year)! Most of our week reminded me of Chicago weather-wise with a fair amount of unpredictability, but that did not stop us from taking in the city streets and countryside. Ireland has a population of almost 5 million people and ten percent of its population lives in Dublin. With an endless view of the Atlantic, Ireland offers a unique cultural experience that is heavily rooted in history. At this time Northern Ireland is a British province which is currently complicating the politics of Brexit. The future of the Republic of Ireland (Southern Part) along with its Northern neighbor is unknown at this time and it is top of mind for all residents. Politics and weather aside, the Irish are VERY hospitable and happy people. A full time work schedule is 36.5 hours/week, public transportation is super convenient, and pint of Guinness costs less than a bottle of water…what is not to be happy about! Since the weather was un-cooperative during our visit and since we were travelling with our kids, we kept our schedule light. We did not venture too far outside of Dublin, we made only one day trip out to see the Cliffs of Moher. In the video below I have highlighted the few things that we enjoyed above all else during our visit. Every picture I have EVER seen of Ireland included dramatic landscapes with tall cliffs along the ocean. I knew that no matter what, I had to see them myself. We chose to visit the Cliffs of Moher versus the Ring of Kerry and Dingle purely based on driving distances from Dublin alone. Had the weather been better, and my kids older (ages 7 and 9), I would have loved to have ventured out further. The Cliffs of Moher, however, did not disappoint as you can see from our photos. I am not sure where in the US you can find ANYTHING that looks like this (but this place comes to mind). This stop also has a museum and interactive exhibition that is great for adults and kids. 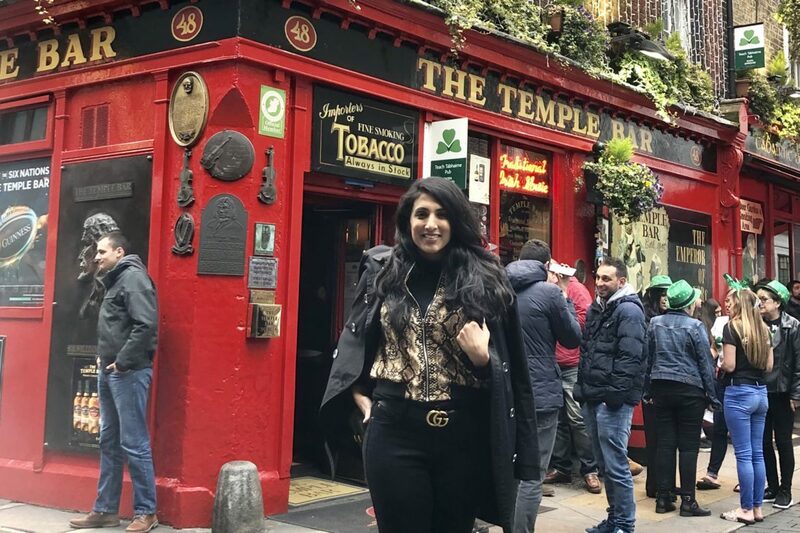 If you follow us on Instagram (@chicksandsalsablog) you would have caught my journey through Dublin using local transportation like the bus and train line. One of our favorite ways to see a city is through the eyes of a local citizen. My husband and I like to visit hole in the wall cafes and the local library just to really get a pulse of what life in the city is like. I came across a very helpful article suggesting that visitors take the local train line, the DART, up and down its 53 km line with recommended stops. This ended up being an amazing idea that was affordable, comfortable, and fun! We made three notable stops, Killiney Bay, Bray Mountain, and Howth, we also wanted to see Malahide Castle but conceded to the rain. When in Howth be sure to pop into Wrights FindLater Restaurant and have an amazing cocktail crafted by the bartender, Ben. I wore my go-to travel accessory EVERY day!! Since we are not huge Guinness beer fans we decided to skip the Guinness tour and opted instead to visit the Jameson Distillery. Built on the original distillery site from 1780 on Bow Street, the venue itself is amazing, but paying the 50 Euros for the tour is one hundred percent worth it. They have created a really beautiful, classy, and thorough tasting experience that really makes you understand the whiskey itself. Our tour had ALL Americans in it which the tour guide thought was amusing since the US consumes half of the Jameson exports alone! After visiting I have a new favorite cocktail, Jameson whiskey with a splash of ginger ale and lime, shaken and poured. Sláinte (Cheers) as they say in Ireland. Shop This Fun Snakeprint Bomber for less than $30! Visiting Ireland and staying with family truly was a pleasure. There was a little something to for everyone – cousins for the kids, company for us, sights to see, music to hear, and flavors to taste! All in all, Ireland was a wholesome European experience with heritage that runs deep into its Celtic traditions. It’s true from coast-to-coast and across all airports there is one bag on everyone’s back. Let’s call it the #TUMITakeover since there seems to be something for everyone in their collection. These bags are streamlined, sophisticated and lightweight making it perfect for weekend or travel adventures at a moment’s notice. We have shared our love for Tumi products in our gift guides and believe that they make a great gift for any friend or family member you have! Bags that can keep our files from creasing and our laptops from getting in the way are a must for women going from the office to happy hour! Let’s face it, I never leave the house without snacks, water bottles, my camera, an extra layer of clothing for the kids and god knows what else! With that in mind, these bags are perfect for getting that ‘trendy mom’ look. For lighter daily use bags they have a very affordable line coming in at just about $100 that you will love. I have bought these for my mom and sisters, they are just too perfect! Yep, you guessed…there is something for the guys too! If you have been on the market for a new bag that makes your life easier, look no further than Tumi, they currently have many items on sale, see them all here! Lately I have been traveling a lot. No, I’m not a consultant…no, it’s not work related, and yes, its all just for fun. I’ve always loved a packing challenge and my husband supports it, in fact he taught me how fun traveling could be if I packed less. At first I didn’t understand what that even meant, in time I started to realize why. When you pack less, you worry less, less to lift, less to pack and unpack, and less to lose. For example, our trip to Aspen moved faster simply because we just had carry-on’s. On our way back, flights were canceled and we were able to get re-booked on another flight easily because we didn’t have any checked bags. Not checking in a bag not only saves money, but also time and space when you travel by plane, train, or car. So you may wonder why I’m even writing about this, simple, people always ask me “what the heck do you pack? and how?” So packing less over the years has become a challenge for me, I research different products and keep up with the seasons must haves. I came up with how I travel smart without sacrificing the fashionista in me. Lets face it, do we really end up wearing everything we pack? No. Do we really need to pack 4 pairs of shoes? No. Do we really need all that makeup? No. Once you answered all those questions then the next question is, what are the most realistic things you NEED according to your itinerary? If you are travelling with family, you only need one swim suit, but with friends, pack 2. Throw in 2 cover-ups, 1 pair of shorts, yoga pants for daily wear (and possibly night), 4 dresses (2 semi-formal and 2 maxis). Maxi’s are elegant and easy to pack. Add in a few tops, 5 at most, and you are ready to go! Of course we can pack 6 pairs, but are we really going to wear them? No! My solution is a pair of flats that could go in a pocket of your bag or tote. A pair of wedges or heels, I prefer wedges, heels can be tricky in a tropical place or beach. Last but not least, sneakers if you intend on doing excursions. When you are out in the sun, the last thing you want to do is have a melted makeup look. Pack foundation, a powder, mascara, eyeliner and a few fun lip colors. Don’t overcrowd your bag or mind with all of your makeup. There is plenty of sample size makeup out there. I subscribe to Sephora’s Play Box and many of those things come in handy, from face primer, lip-gloss, to skin care. In fact I even take sample size perfume vials with me, no worries of spillages, leaks or taking up room. DONE AND DONE! I always pack my jewelry in a travel box and stuff into my large tote or bag. Lately, I love Tumi bags. They are not only soft but also durable while travelling. They are also easy to clean and expandable when need be. Mine has compartments for me to take essentials like medication, lotions, books, and even my IPAD! Pack less enjoy more, that’s pretty much the motto in my household these days. Life is too short to clutter your suitcase with nonsense, de-clutter and be free. With a population of about 21 million (including the metropolitan area) I had thoughts of what the city might look like. Much to my surprise Mexico City turned out to be completely different than I had imagined. As Americans, we have a decent amount of exposure to Mexican culture – language, food and some customs. Growing up as an Indian American, I’ve always drawn parallels between the Mexican culture and Indian culture as both are filled with lots of color, food and deep-rooted customs. Mexico City did not let down in any of those categories. I wanted to break down the 3 things I would recommend checking out if you make your way over to Mexico City! This is a one of a kind authentic Mexican experience that can’t be missed! It takes about an hour to get to from Mexico City, but is totally worth the drive! Upon arrival it will be suggested to use the restroom, make sure you have some money on you…. they charge 5 pesos to use the facilities. There are dozens of brightly colored house boats waiting for you, if you plan ahead you can even have one of them personalized just for you. You will have someone on board to do the rowing, it feels like Venice but with a Mexican twist. There are two long tables with chairs to seat 20. Many people pack large picnics and make a day out of the excursion. While rowing down the river you can see other houseboats with mariachis on them. If summoned they come on board and perform (for a nominal fee). Of course we did this and what a treat it was! They also have boats with fully equipped kitchens, so you can order hot and ready to eat quesadillas and tacos, so fun! We scored tickets to see Cruz Azul play Pachuca. This was my first soccer game, ever! The stadium was clean and for about $50/tickets we had some pretty awesome seats! Soccer is a huge sport for Mexicans so to see their excitement and loyalty to their team was a treat! I would recommend a stop in if you have time! Sporting my new Cruz Azul gear! I’m not quite sure what I expected from the culinary scene in Mexico City, but I was pleasantly surprised by the number of beautiful restaurants and the delicious food that we had! There were two particular restaurants that stood out to me that I wanted to share. Situated right in the middle of the city Square, this location would be an easy one to squeeze into your itinerary. The restaurant is absolutely stunning! As you first walk in you’ll see women making fresh corn tortillas which was a nice first impression! The service was impeccable as was the food. As a vegetarian I can vouch for their selection. The molè sauce was one of the best I’ve ever had! Make sure to try one of their delicious Mezcals. Mezcal has more of a smoky flavor than tequila and requires a little bit of getting used to. I found it to be a little too strong for my taste buds, but it is a must try anyway! This particular restaurant is in Palanco. Our hotel (Las Alcobas) was in Palanco which is considered one of the posh-ier sides of Mexico City. Blanco Castelar is stunningly beautiful to the eye, but the food is also fantastic! Although it was not a full Mexican menu, a lot of their items had a Mexican twist to them. It wasn’t the most vegetarian friendly place, but I still had enough options. I ordered the risotto de esparragos and it did not disappoint. Stop in for a cocktail and bite, you will be glad you did! Mexico City is a beautiful culture-rich city! If you’ve done the beach towns, consider Mexico City on your next trip south of the border! Become a Chick - Join The Club! Get invited to exclusive events and see what the Chicks are working on!